RUSH: Let’s look at some of the reaction — and, by the way, have sound bite number two standing by. The first sound bite today that they gave me here on the roster is me back on February 15th talking about how Trump could overcome all this opposition by staying focused on the domestic agenda. If he would just do that, that’s the way to keep his base. And not only keep his base, that’s the way to expand the base. That’s the way, because that’s why he was elected. And I was happy to see that that’s what that speech last night was. It was a home run in that regard. It was a home run in every aspect of it, and apparently a lot of people agree. “More than 3 in 4 Americans who tuned in reacted positively to President Trump’s Tuesday night address to Congress, according to a CNN/ORC poll.” It’s 78%. Notice the headline: “More Than 3 in 4…” How about just use the number? It’s 78%, and let’s round it off to 80. Since you people are trying to diminish it, let’s compensate for your attempt to diminish. Let’s just call it 80% give thumbs up to Trump’s speech. 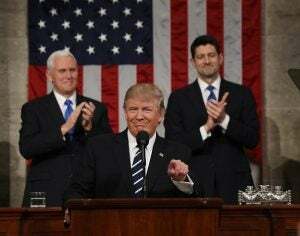 “Among those who watched the speech, 57% said they had a ‘very positive’ response, while another 21% described their reaction as ‘somewhat positive. '” It was 509 Americans who watched Trump’s speech, with a margin of error of 4.5 points. “CNN polled about 8% more Republicans than Democrats, and the news network noted that people who watch political speeches, like Trump’s on Tuesday, tend to be more receptive toward the speaker right off the bat.” Is that why it happened? Oh, that’s it! It has nothing to do with Trump. No, no, no. It’s all about viewing patterns that people have. CNN’s reporting this on their own website. They’re clearly disappointed. They essentially report the same numbers. Oh. This is doubly important. He talked about the need for allowing people to buy health insurance across state lines, and he hammered that last night, and he emphasized that. You know what? Just now going through this, I remember there was another story yesterday. Just like the McMaster story, his chairman, National Security Council. There was news all day yesterday that McMaster had succeeded in removing the phrase “radical Islamic terrorists” from the speech, and the Drive-Bys were ecstatic, and the Never Trumpers were ecstatic because they thought an adult finally had prevailed with Trump. And then they started writing stories, “How long will McMaster last now? You don’t get to dispute the chief like this in the open and survive,” and then Trump gives the speech, and he practically shouts the phrase. And the same thing with this. There was a story — and I’m sorry; I can’t remember who, what, when, where, why on this, because I absorb so much in my voluminous, omnivorous pursuit of information here. But there was a story yesterday that alluded to the fact that Trump might go soft on that, too, in an effort to get a deal. (chuckles) And last night, once again, he practically shouts that any fix for Obamacare must include allowing people to buy insurance across state lines. Now, one member of the media, I think, accurately saw what happened last night for awhile. Major Garrett, CBS. This was after the address to the joint session, and this is Major Garrett talking about what everybody just saw. RUSH: Exactly. But that’s not new. The reason I’m going back to this is because I made a big deal of this in the first hour, and I think this is really right. I think it’s very important. The Drive-Bys think they saw something new last night. And the Democrats, I’m sure, think they saw something new because the Democrats have really not paid attention to Trump. And do not pooh-pooh this. You think, “How could they miss it?” Very easy. All they do… Why did Hillary think she was gonna win in a landslide even at nine o’clock on election night? Do you think Hillary ever watched a Trump rally? I betcha she didn’t. She probably had somebody else do it and report to her, and what do you think she said about it? “Yeah, Hillary, we got nothing to worry about. Yeah, they were big crowds. But, man, half of them have no teeth. They’re showing up in pickups, and they got gun racks in the back, and don’t speak English very well. I mean, it’s Deliverance, Hillary. You’ve got nothing to worry about there. “I mean, half of them probably don’t even know how to vote, Hillary.” That’s what she was probably hearing about it. (interruption) Do you dispute that? I think it’s right on the money, and I think when a Trump rally happens… Do you think Chuck Schumer actually watched one? Do you think Debbie “Blabbermouth” Schultz actually watched one? I don’t think they watch ’em. I think they listen to what their media says. It’s their comfort zone. So last night, they see what they think is a brand-new Trump. 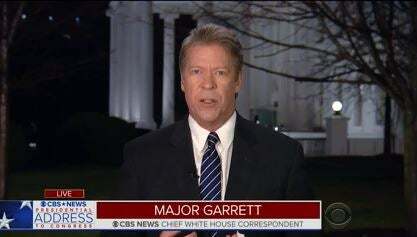 But Trump’s voters, Major Garrett’s right, that’s exactly why they elected the guy, but it’s not different from what he was on the campaign trail. You know what Trump voter knows? A Trump voter knows that their man is an intelligent, sensitive, responsible human being and that addressing a joint session of Congress is a different event, different circumstance than a campaign rally in an airplane hangar. And Trump’s an adult enough to know this. So of course they’re gonna have different tones and they’re gonna have different characteristics. You don’t deliver a State of the Union speech in an airplane hangar at a campaign rally. By the same token, you don’t do a campaign rally to a joint session of Congress in the chamber of the House of Representatives. But these guys in the media and all these witnesses are acting like, “Whoa, we’ve never seen this guy before.” But Major Garrett’s right, as I am. Everybody who voted for Trump, this is exactly who they voted for. There was nothing new last night. There wasn’t any new in content. I even had some people — get this — I had some pessimists emailing me, “Well, this is nothing more than a campaign speech. My God, Trump can’t even read a teleprompter. Oh, my God, we’re sunk,” and stuff like this. I said, “Are you kidding? This is a grand-slam home run. Look where this speech is happening.” Of course, if you watch every speech Trump makes, this is gonna be old hat. That’s my point. To people that don’t watch Trump, deride Trump, impugn Trump, this was new, they’d never seen this before. Yet everybody that voted for Trump has seen it so many times that they couldn’t wait for him to be elected. “I’m not hearing anything new. This is a campaign rally.” So there are all kinds of interpretations of this. But the point is that no matter whether the original reaction was upbeat, positive, home run, or a little bit pessimistic, there wasn’t somebody that nobody had ever seen last night except for the Drive-By Media and except for the Democrat Party, and that ought to speak volumes to you. I mean, these are the people whose job it is, according to them, to defend and protect the Constitution. They are there to defend and protect the country. And they don’t even know who Donald Trump is, even now. Here’s a montage of how that sounded. CHRIS WALLACE: (outdoor noise) I feel like tonight, Donald Trump became the president of the United States. ALEX CASTELLANOS: (b-roll noise) I think he became president tonight. CHRIS STIREWALT: He did sound like the president, look like the president, act like the president. GAYLE KING: (outdoor noise) Dare we say that for the first time, I’m hearing people say he looked and sounded presidential. ANA NAVARRO: …sounded presidential for the first time. MATT GUTMAN: Wow, he sounded so presidential. MITCH MCCONNELL: Donald Trump did indeed become presidential tonight. TOM BROKAW: (b-roll noise) Tonight, this is easily the most presidential that he’s been. DANA PERINO: The best speech I have ever seen him give. This was so presidential. VAN JONES: He became president of the United States in that moment. Period. If he finds a way to do that over and over again, he’s gonna be there for eight years. RUSH: Okay, that was Van Jones. More on him here in just a second. Now, I realize — not nitpicking here — many of these people are trying to be complimentary. And I don’t want to make too big a deal about this, but once again, note how many people report, conclude, say the same thing. And they were not watching each other. They were on their own networks. Now, they may get emails — Chris Wallace was the first I heard say it, and it was not rehearsed with him. He was on a riff and his rap just took him to that conclusion. And I wonder, after he said how many tweets and how many emails went out, “Chris Wallace just said,” and other Drive-Bys were, “Yeah, yeah, that sounds good, I’ll use it myself.” You don’t think it happens that way? Okay. Well, all right. Snerdley says it was spontaneous reaction by each and every one of them, based on what they saw.